Within a PLC course, as an introduction, I was required to develop an application for the “Moeller EasySoft PLC”, a rudimentary PLC when compared to current industrial standards. During code development, PLC programming techniques and standards had not been taught beyond the mechanics of ladder logic processing, latching and memory use. 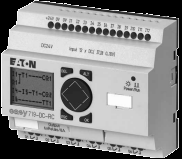 This application was widely recognised as the best in the class and the only project to fail-safe on controller power loss, attempt to recover from an error and to have verbose error diagnostics. The majority of the functionality is highlighted in the datasheet embedded below. There is also a Project Sub-Site containing the ladder logic used, presentation and general write-up. On reflection, the only addition I would prioritise would be to make use of the LCD screen to display messages instead of just setting diagnostic memory bits (I did not realise this was possible and only one other group made use of the LCD screen). Credit to Anthony Moody and Nic Wilson as project partners.